The conversation below sheds a little light on Sankai Juku founder and artistic director Ushio Amagatsu’s philosophy of butoh, dance, and art. Yoshida (hereafter “Y”):	Sankai Juku was founded in 1975, more than 30 years ago. For all these years, you have consistently created new works and toured extensively throughout the world. I am honored to have this opportunity to interview you on behalf of the Sankai Juku’s North American tour management, Pomegranate Arts, and the 12 presenters and their audiences of the upcoming North American tour. First, would you tell us how you encountered dance and Butoh, and what kind of impact Butoh had on you. Amagatsu (hereafter “A”):	While studying theater in my youth, I encountered ballet and other dance forms. This was in the late 60s to early 70s*, and as time went by, the non-verbal, physical methods of expression remained with me and in this context, I encountered Butoh. The Butoh had such impact on me because it had completely different ways of using the body from ballet and other forms of dance that I had been trained in. I was also strongly drawn to Butoh because of its peculiar approach towards creating works. I feel like I just naturally melted into the whirlpool of the creative energy of Butoh. Y:	You founded your own dance company, Sankai Juku, because you had a specific theme and style that you wanted to pursue. Please share with us your initial vision in founding Sankai Juku. A:	I had been a member of Dairakudakan** which then (and now) consisted of a large number of performers, and focused on expressing the “proliferating” energies. In contrast, I wanted to create a company that consists of a small number of dancers and explores the possibilities of expressions that can be attained by “the less”. Y:	The common understanding of Butoh is that the art form was founded by Tatsumi Hijikata and Kazuo Ohno, and that Dairakudakan, Sankai Juku, Byakkosha, etc are the few leading companies to immediately follow the founders. Yet, after 30 years, Sankai Juku has established its own dance world, even though Butoh may be the starting point or a method. Please elaborate on this. 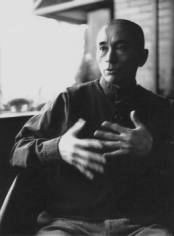 A:	While I respect and pursue the basics of Butoh, founded by Tatsumi Hijikata and Kazuo Ohno, I was determined to establish “my own Butoh”, by confronting my “self”, just as the founders did so to establish the art form (genre) of Butoh. I thought that it was important not just to inherit Butoh from the founders, but simultaneously to pursue my own path, because the background/social context of the work, individual experiences and characteristics (qualities) are all different. Y:	There are themes and images in Sankai Juku’s work, such as Life, Death, and the Universe that are often reflected on by performers who seem to represent neutral existence. In creating “Kagemi”, what was the main inspiration? A:	Not just “Kagemi”, but in other pieces as well, I consider human beings and human nature to be the basic themes of my works. I think that what urges me to create new works are those unresolved elements in my mind, such as the mystery of an individual existence which possesses its own physical body but relates to everything around it by influencing and being influenced, or that of my own physical body that exists here and now but simultaneously encompasses much longer time preceding my existence. Y:	In one of the recent review articles of “Kagemi”, a critic referred to the Sankai Juku aesthetics as “The East seen through the Eyes of the West.” Do you think this is because you have toured the world extensively, and are based both in France and Japan? A:	“The East seen through the Eyes of the West” is a profound proposition to me, but this was a perception of a critic who saw my work. I do not have a particular intention to direct my works based on such a specific point of view. I think my basic concepts for creation are “the differences” and “the universal”. Y:	In a recent interview, you refer to an image of a scale, searching for a state of equilibrium. In one plate is culture, with all its distinct differences, the other plate is the universal. I think that to search for the equilibrium balancing the conflict within is one of the characteristics of traditional Japanese values and culture. This may be one of the primary reasons why Sankai Juku remains distinctively Japanese in aesthetics to me. In the era of globalization, what do you think about future possibilities for Japanese culture? A:	When I spoke about the image of scale, I was referring to the importance of the differences among cultures; that such differences are the factors which form and develop individual culture; and on the other end of the spectrum, the importance of the universality of human being, I consider these two concepts to be the basis for my creative works. I spend a lot of time outside of Japan, but each time I return to Japan, I always observe distinctive “Japanese-ness” even in contemporary Japanese culture and society which is significantly Westernized. I think that such “Japanese-ness” will continue to develop as distinct cultural characteristics. Y:	When I first saw Sankai Juku’s work over 20 years ago in Tokyo, I was astonished with the inimitable beauty of “acceptance”. It drew a sharp contrast between the ballet techniques which emphasize the extension – as if to conquer the space around oneself. In contrast, Sankai Juku dancers moved their fingers, bent their ankles seeming to “accept” everything around the space and even to respond to the subtle wave or particles in the air. Maybe this is one of the reasons that the audience is so enthusiastic about your work – because we are tired of the aggressive mentality of contemporary and/or Western/American society. Y:	What is your secret to maintaining your body as a dancer and adding depth to your dance for well over 30 years? Do you have specific trainings or a regimen in your daily life? A:	When I need to go on performance tours or start working on a new piece, my daily schedule becomes quite demanding. So, I make an effort to live as quiet a life as possible for the rest of the time. In terms of the trainings, as I grow older, I mainly swim quietly and practice stretching in order to maintain good physical conditions. Y:	I understand that you directed your new young member to perform the Sankai Juku’s 2nd piece, “Kinkan Shonen” (premiered in 1978) last year. Are you interested in raising successors? A:	Yes, I am. Regarding last year’s “Kinkan Shonen,” I thought that it was important to convey the sensibility of the work I created when I was at the age of the young performer. Also, I realized that I need the physical strength and toughness of young performers that can take the demanding choreography when I start to think about the new work. Y:	I believe that it is very different to dance yourself, and to choreograph for other dancers or to direct operas***. Would you share with us the challenges and benefits of working or collaborating with other dancers or artists in different art forms? Do the experiences of your work outside Sankai Juku inform your work with Sankai Juku? A:	My work with Sankai Juku always serves as a base, so, it’s rather that the Sankai Juku’s works are reflected upon other projects outside of the company. I think that’s what people expect from me. Of course, the method is different in each art form, but when I worked on a new opera, “Three Sisters,” what I tried was to juxtapose and reflect on the three different expressions on one stage, straight play, deformed jest, and abstract dance. I’d like to consider my work in the other genres as more reflections than challenges. Y:	As you travel and work internationally, you meet with many artists from all over the world. We hear that you have an ongoing friendship with some great artists such as Pina Bausch. How do artists influence each other? A:	It is a great pleasure to meet with other artists, but I rarely discuss works or artistic directions with them. Perhaps because it is a profound experience of the contemporaneousness to meet with the fellow artists who share commitment and discipline toward artistic creations, it is a matter beyond specific artistic style or expressions. *There was a strong movement of diverse, experimental performing arts in Japan in the late ’60s to early ’70s. **Dairakudakan was founded in 1972 by Akaji Maro, who remains as the leader of the troupe today. The founding members included Ushio Amagatsu as well Isamu Osuga (of Byakko-sha), etc. ***In 1989, Amagatsu was appointed the artistic director of the Spiral Hall in Tokyo where he directed “Apocalypse” (1989) for a Brazilian dancer, Ismael Ivo, and “Fifth-V” (1990) for the U.S. dancers. He also directed Bartok’s opera “Bluebeard’s Castle” in Tokyo (1997) and the world premiere of Peter Eotvos’s opera “Three Sisters” at Opera National de Lyon in France (1998). Visit the DanceHouse website to subscribe or to order tickets to Sankai Juku. ~ by DanceHouse on September 23, 2010.